AP Calculus AB is a two-semester course designed to provide students with experience in the methods and applications of calculus and to develop an understanding of its concepts. This course emphasizes a multi-representational approach to Calculus, with concepts, results, and problems being expressed graphically, numerically, symbolically, analytically, and verbally through the use of unifying themes of derivatives, integrals, limits, application and modeling, and approximation. AP Calculus AB is a very rigorous course designed for those who choose to pursue a higher degree in a field that requires a lot of math. However, anyone who chooses to take AP Calculus AB is welcome to take it, no matter what field they choose to go into. The class is intended to challege students and prepare them for college level classes. My main objective in teaching AP Calculus AB is to enable students to receive the tools that they will need to succeed in future mathematics courses. Students come into the class from Pre-Calculus and know that AP Calculus is a college preparatory course and they know that they will be working hard with the expectation that their hard work will enable them to not only succeed in the course, but discover the joys of advanced math. 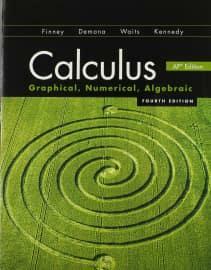 The book we use, Pearson’s Calculus *AP Edition (Finney, Demana, Waits, & Kennedy), is pictured below. Because of the number of students typically taking AP Calculus, there has always been enough books for the students to have one for their locker, one to take home, and one to leave in the classroom.